Responsibility for providing the EPC lies with the "relevant person" when building, renting out or selling a property. For newly built dwellings the relevant person is the builder. When letting a rental property this is the landlord. For the sale of a privately owned property it means the person selling the property. 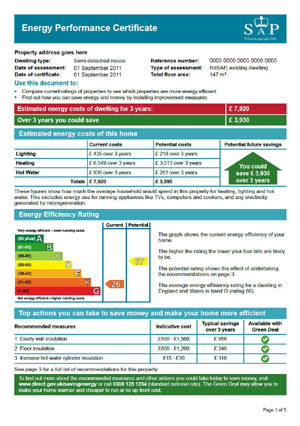 The EPC shows the energy efficiency rating (relating to running costs) of a dwelling. The rating is shown on an A-G rating scale similar to those used for refrigerators and other electrical appliances. A sample of an EPC can be found on the right of this page.